You know those organisations that just seem to be on a special mission? The people there seem to exude possibility and commitment for what they’re doing. They are companies that inspire trust – among their employees, customers, and spectators alike. In my experience, these organisations are like that because they know their Why2. In Simon Sinek’s 2009 TED Talk, “How Great Leaders Inspire Action” (one of the most watched TED Talks of all time), he explains the people and organisations that inspire action in others – and evoke trust, loyalty, and followership – think, act, and communicate in exactly the same way. And it’s the exact opposite of everyone else. They think, act, and communicate starting with why. We recently ran a Why Discovery Workshop for a mid-size retail bank that provides banking and credit facilities primarily for people who have not had credit before, or have lost it due to difficulties they have encountered in their lives. We worked with a group of their senior team, and a few carefully chosen other passionate people across the organisation, to help them discover those things that make them most proud, most fulfilled in the work they do. Then, we asked them how doing those things makes a difference to the lives of their customers. After staying with the dialogue for a while, their experience of and connection to a Why started to emerge. They began to experience a sense of shared purpose. Julie stood up and told a story about John, whom she had helped to prepare his application for a bank account and credit card. He had very recently gotten a job, but was still living in a rough part of town and had no permanent home. To get regular accommodation, he needed a bank account and also a financial reference. But to get a bank account, he needed an address – a vicious cycle with no way out. Through some committed action from Julie, however, John got an account, and then a flat. She explained how she supported him to better manage his finances in a sustainable way as he began thriving in his new life. She had tears in her eyes when she told this very touching story, which resonated with many people in the room. Then someone said, “You believed in John, and never gave up on him!” As people in the room listened to the story, many felt inspired, and some reported having goosebumps. Suddenly things became very clear to this group. The sense of purpose they shared was about believing in people, people who had been abandoned by others, and then helping them get access to the world of banking, credit, and finance, opportunities that most other people enjoy and take for granted. Over the coming months, many things in this organisation were tested against their Why, and after some dialogue, ideas were accelerated if they fitted, reshaped if they were a bit off, or stopped if they did not fulfill the bank’s Why. Whenever I see the new adverts on TV I smile, remember the workshop and the profound relationship that this group of people generated to the very thing that bound them together, that had so effectively remained hidden and undiscovered in the day-to-day rush of “normal business activity.” I also know the work went much deeper than merely changing a slogan or a poster, but began a process that reworked the bank’s operations from top to bottom. Like this bank, organisations that Start with Why are grounded in and are able to articulate their purpose, their Why, the very reason they exist, and the difference that they make to others. When purpose is deeply felt, at a personal and visceral level, it serves as a north star, and helps true up decisions, communications and, of course, branding and advertising. 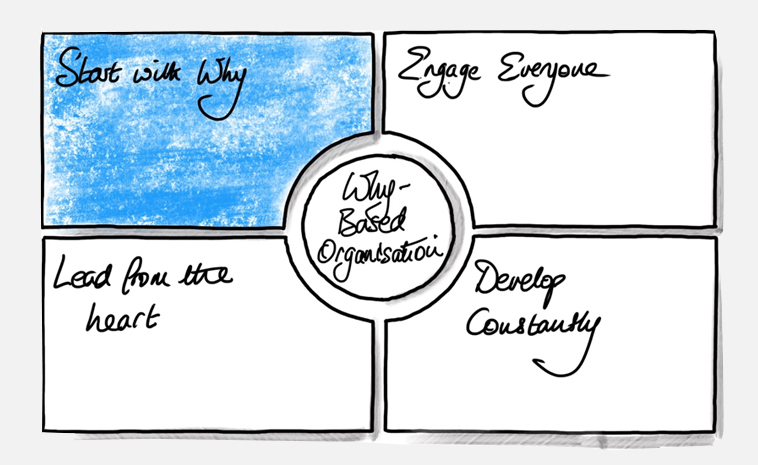 We believe that the best organisations of the future Start with Why, a higher purpose that goes beyond short-term profit or growth. I learnt in that workshop one simple thing: You know you’re on the right track in discovering your Why when talking about it gives you goosebumps. WhyNot Partnering (www.whynotpartnering.com), an organisation dedicated to transforming the nature of work, by creating Why-Based Organisations3., where trust, loyalty, collaboration, and integrity are the norm – and high performance the outcome. To stay connected with us and to hear more about our work, follow us on LinkedIn.